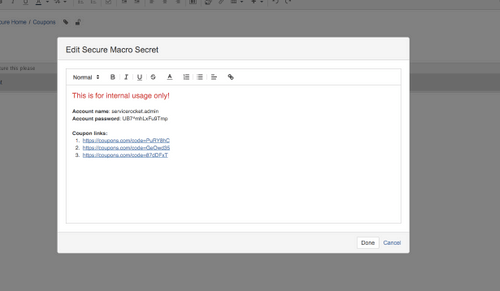 Securely store and share sensitive information in Confluence. Encrypt, manage & audit passwords. There’s not a place on Confluence to store sensitive information and check who has access to it. 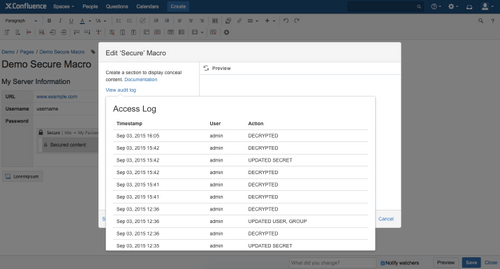 Manage encrypted information and generate reports on them. 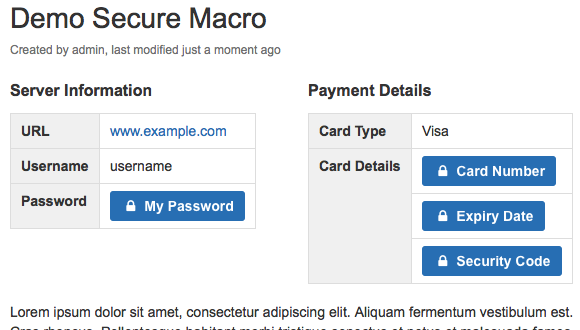 The Secure Macro encrypts sensitive data and displays as a simple inline button for easy access. Data is encrypted and decrypted at the client-side, hence no unsecured data is transferred or stored in the server. Encrypt sensitive information whether it's presented in plain or rich text. Now your secrets can truly be bold, italicized, a hyperlink, etc. You have the power. The Secure Macro keeps a record showing who has created, decrypted, and edited the secured data, all at the fingertips of the administrators.